According to the AVMA: Canine influenza, or dog flu, is a highly contagious infection caused by an influenza A virus. In March 2015, an outbreak started in the Chicago area was determined to be due to an H3N2 strain. This strain had never previously been recognized in the United States, but since this time it has spread to many states and thousands of dogs have tested positive for exposure to the virus. Outbreaks are more commonly seen in situations where groups of susceptible dogs are in close contact, such as shelters, kennels, dog day care facilities, and grooming or boarding facilities. Canine influenza is spread via aerosolized respiratory secretions (via coughing, barking and sneezing) and contaminated objects (kennel surfaces, food and water bowls, collars and leashes) and people moving between infected and uninfected dogs. The virus can remain viable on surfaces for up to 48 hours, on clothing for 24 hours, and on hands for 12 hours. The incubation period is usually two to four days from exposure to onset of clinical signs. The highest amounts of viral shedding occur during this time; therefore, dogs are most contagious during this 2-4 day incubation period when they are not exhibiting signs of illness. Virus shedding decreases dramatically during the first 4 days of illness but may continue up to 7 days in most dogs and up to 10 days in some dogs with H3N8 canine influenza. Intermittent H3N2 shedding for up to 24 days can occur. Because this is still an emerging pathogen, all dogs, regardless of breed or age, are susceptible to infection and have no naturally acquired or vaccine-induced immunity when first exposed to the virus. If the virus enters a kennel or other closed group, a high percentage of the dogs may become infected, and most of these dogs will be symptomatic. Although most dogs have a milder form of canine influenza and recover without complications, some may develop severe pneumonia. Approximately 20-25% of infected dogs are expected to remain asymptomatic, but can still shed the virus and spread the virus. Unlike human influenza, CIV is not a “seasonal” flu – infections can occur year-round. The most common clinical sign is a cough that persists for 10 to 21 days despite treatment with antibiotics and cough suppressants. Nasal and/or ocular discharge, sneezing, lethargy and anorexia may also be observed. Many dogs develop a purulent nasal discharge and fever (104-105o​F). The nasal discharge is usually caused by secondary bacterial infections. Some dogs are more severely affected with clinical signs of pneumonia, such as a high-grade fever (104°F to 106°F) and increased respiratory rate and effort. In November 2015, the U.S. Department of Agriculture granted a conditional license to Zoetis and Merck Animal Health for the production and promotion ​of a H3N2 canine influenza vaccine. Although the vaccine may not prevent H3N2 infection altogether, efficacy trials have shown that it may significantly reduce the severity and duration of clinical illness, including the incidence and severity of damage to the lungs. In addition, the vaccine reduces the amount of virus shed and shortens the shedding interval; therefore, vaccinated dogs that become infected develop less severe illness and are less likely to spread the virus to other dogs. 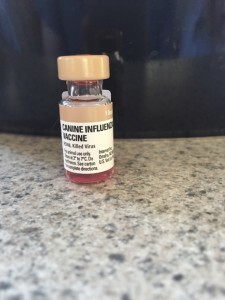 Animal Care Center is now requiring this vaccine for all patients that stay in the kennel, are groomed, or are undergoing surgery, and we recommend it to the owners of all dogs that may have potential exposure to the virus.